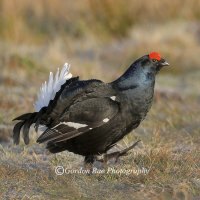 Quoted as being one of the best sites in the UK to photograph Black Grouse lekking at dawn. 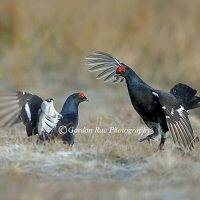 The lek itself is on the crest of a hill with a three person wooden hide positioned nearby, from there we will have opportunities to photograph the grouse displaying, fighting and preening, along with chances for close up portraits of these stunning birds. Your walk to the hide will involve a 15/20 minute uphill walk over exposed ground. We recommend an ideal lens combination of around 400 to 600mm in length. Price:- please contact us for prices and availability.. 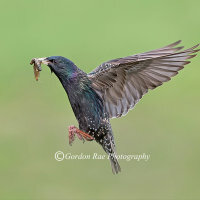 The Starling hide is situated in a farmyard where the birds are well used to activity and people around them. 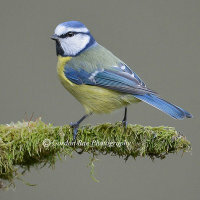 With a view along the side of an eye level building the birds land on a beech hedge or the nearby rowan trees before flying the short distance across to their nest, this gives endless opportunities for flight shots over a short distance. 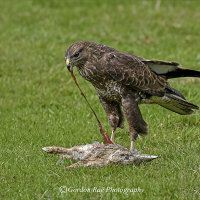 It is an ideal hide for beginners starting out on flight shots. A small hide situated in a garden with a decent variety of garden and woodland birds visiting the feeders on a regular basis. This hide is ideal for beginners building up a portfolio of small birds and working at catching in flight confrontations between the birds. 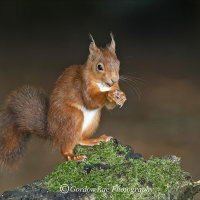 The Squirrel hide is a newly constructed hide situated on the edge of a well established natural pine woodland with exceptional backgrounds and good morning/mid day light. The hide is a 100 metre walk along an easy path from your car and is best suited for two people with kit bags etc, (but can seat three if needed). 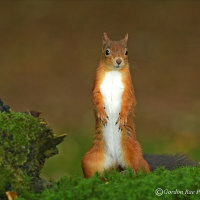 Here you can either use beanbag or tripod, or both with one camera set up for perched shots and the other for woodland floor images in the background. Lens length = 300mm maximum (on a full frame camera) for stumps and perches while 400 - 600mm will get you shots on the woodland floor and background trees. NB/ There are no toilet facilities on the site. 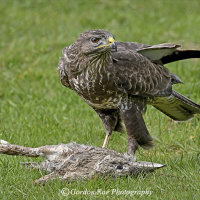 The hide is situated in the corner of a field that the buzzards have frequented for a number of years now. They are fed mainly on road kill or waste from a local game dealer, there is also a small selection of perches or stumps to help you obtain a variety of different shots for your portfolio. This hide is operated under very strict rules as a lot of work has went into making this hide what it is today. You will be taken to the hide by quad bike, the bait put out and left, as the quad bike leaves the birds can appear at any time after that, sometimes instantly sometimes a while later. 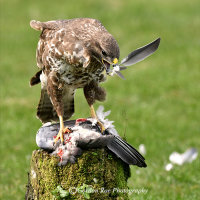 This is strictly a no smoking hide, mobile phones should be turned to silent, and all talking kept to a quiet whisper as the buzzards often sit in a tree less than 10 meters away from the hide. You must NEVER LEAVE THE HIDE at any time throughout the day, when you are ready for home you either call or text and you will be collected by quad bike. This is a purpose built wooden hide for 2 people maximum, there is also a portable toilet for emergencies within the hide. The longer you are prepared to stay in this hide the better your chances are of success. The cost of your day is priced at only £75/day/per/person.